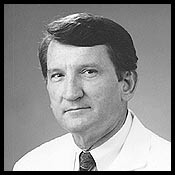 The Patrick J. Scanlon MD Cardiovascular Research Fund was founded to support research for cardiovascular disease. Throughout his career Dr. Scanlon was not only passionate about helping his patients but also in driving heart research. After he passed away in 2005 at the young age of 67, the Scanlon family established this fund at Loyola University Medical Center outside Chicago to support research at the Cardiovascular Institute (CVI). Loyola is a 501(c)(3) organiztion and all donations are tax deductible. We would like to thank all of the many friends, colleagues, and patients who have supported us and the fund! Why do we need more Cardiac Research? Despite advances in the diagnosis and treatment of heart disease, it still remains the number one killer in the United States, according to the American Heart Association. Approximately one million individuals die with heart disease each year. The good news is that over the last twenty years cardiac research has saved the lives of millions of people! Where do the fund proceeds go? All proceeds from the fund are held under Loyola University Medical Center's charitable foundation but kept separate and desigated for Loyola's Cardiovasular Institute (CVI). The CVI uses the money for research initiatives at Loyola. Loyola is consistently ranked in US News and World Report's lists of "America's Best Hospitals". What kind of research is done? The CVI supports basic and translational research. Basic research studies disease at a molecular or cellular level. Translational research attempts to take basic findings to the bedside. Most of the research centers around physiology, pathology and pharmacology issues. Click CVI current research to see some of the things they are working on right now. To read more about some of the research Dr. Scanlon was involved with click: cardiovascular research articles. ***** We would like to thank Loyola's Cardiovascular Institute for the first annual Patrick J. Scanlon, M.D. Memorial Lecture they put together in the Van Kampen Conference Center at Loyola's EMS Building on April 29th, 2014. Dr. Kim Eagle, Director of the Cardiovascular Center at the University of Michigan Health System presented a tremendous lecture on “Acute Aortic Syndromes: Lessons from Clinical Trials, Registries, and Translational Science” to a packed house! We appreciate all of the kind words of support left in our online guestbook.. To leave a note or to view some entries, please see the Scanlon Guestbook. Pat's family misses him very much. On our family page we have put together some of the fun things we remember about him as well as some pictures. Please check The Family page. Click Here to Tell a Friend about the Fund!